I haven't worked on this project for some time, I still think it's a good idea and there is some initial code. However I consider it low-priority for now. Sebastius actually built something like this already, making this thing obsolete. This project is about a usage counter for the laser cutter at revspace. Currently, the original purchase cost of the laser cutter is recouped by asking E2,50 per 15 minutes of usage. People have to keep track of time themselves, it is not very fine-grained and this cost-model does not take into account how intensive the laser cutter is actually used. account for the actual usage per time unit, for example count usage in proportion to laser power (the assumption is that using lower power produces less wear on the laser tube, which means longer life). A low-pass filter is needed to average the PWM-signal before measuring it. The LAOS-board in our laser cutter probably runs at a PWM frequency of 20 kHz (the default). To display the usage counters, a Nokia 5110 display (84x48 pixels, or 6 lines of 14 characters) is used. The button is a push button. Pressing it causes the session counters to be reset back to zero. The lifetime counters are never reset. An arduino nano or mini pro is likely sufficient. The internal timer is used as a time base, probably accurate within 100 ppm. 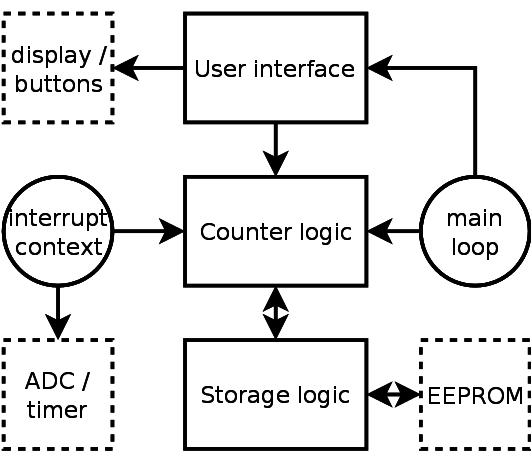 The internal EEPROM is used for storage of the counters. By using a smart wear-leveling mechanism, the lifetime of the EEPROM can be stretched to several 100 thousands of operating hours, which should be sufficient (longer than the laser tube lifetime). The wear-leveling algorithm works by storing the data to be persisted in a different location every time. For example, if we have 16 bytes to store, we can define 64 slots in the arduino 1kB EEPROM. Each slot contains a sequence number and a checksum. When reading, we read all slots and select the slot which has the highest sequence number and a valid checksum. The checksum makes it likely that a half-written slot can be detected (e.g. when a power-down/crash occurred during writing). An invalid slot can be skipped this way, and we automatically fall back the slot before it. When writing, we simply write to the next slot than the one we read from, using a higher sequence number. Assuming a write frequency of once per minute, it takes about 64 * 100,000 writes before the EEPROM reaches its official limit, this amounts to about 100,000 hours. Total bytes per slot: 128 bits, or 16 bytes. A 16-byte slot is nice, because we can fit 60 of those in the EEPROM (1 hour worth of logging) and still have 64 bytes left (e.g. to store settings). Counter times are counted in minutes. Life-time counters are 22 bits, so they can fit a maximum of about 70k hours. Session counters are 10 bits, so they can fit a maximum of about 17 hours. The power-up counter is 16 bits, so it can log a maximum of 65k times power-up. If using a 16-bit CRC for the checksum, the best choice to protect our 112 bytes of data is the one with polynomial 0x9eb2, according to this great page on CRCs. It can reliably detect up to 6 flipped bits. Software development is on github. This page was last modified on 14 February 2016, at 11:55.